Scottish Opera’s hugely popular Opera Highlights tour to smaller, more remote venues will visit Midmar’s Village Hall next month. The spring tour will arrive in the north east on Tuesday, February 13. Scottish Opera’s Head of Music, Derek Clark, has curated an extremely varied programme including favourites from Rossini’s Barber of Seville, Mozart’s Cosi fan tutte and Gilbert and Sullivan’s The Gondoliers, as well as lesser known gems rarely performed on the Scottish stage. Opera Highlights, which tells the story of Henrietta and Leon, two stage managers who have to cope with the demands of opera stars Sophia and Petrach every night on tour, also features a new work, entitled ‘Wings’, created especially for the tour by Scottish Opera’s Emerging Artist Composer in Residence, Samuel Bordoli. With something for everyone, from opera first timers to seasoned fans, Opera Highlights promises an intimate performance of great music. The cast of the spring tour is full of fresh new talent and returning favourites. Director Jack Furness said: “Autumn’s Opera Highlights was a really beautiful show to make, and re-exploring that with a new cast is going to be a fun adventure - I’m looking forward to it hugely. “William Morgan and I had a great creative partnership going in the autumn, and it will be great to see how we can push his character further. Scottish Opera’s General Director, Alex Reedijk, said: “Touring Scotland is at the heart of what we do and Opera Highlights is the perfect show to take to smaller and more remote communities around the country as it truly has something for everyone. “After a successful 17-date autumn tour, which saw the Opera Highlights team travel around Scotland from Stornoway to Stranraer, we’re thrilled to be able to take the show on the road again this spring. 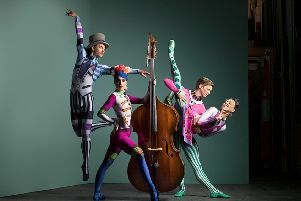 To purchase tickets either visit www.scottishopera.org.uk or phone Amanda on 07980 736499.